Some people choose to blog in secret. Some choose to use a pseudonym online, while some choose not to tell their friends or family. And I totally get it, because I’ve been there. For years I kept my blog a secret. I didn’t tell my family or friends that I was writing a blog, learning to code and building websites. It was all hush-hush. I was embarrassed about telling people about what I did in my spare time. I was about 14 years old when I started using Piczo and I thought that most people my age would think that building websites was lame. I also thought that my family, who are all older than me, wouldn’t get it, and think that a 14 year old should be doing better things with her life. Not to mention the fact I was talking to “strangers” online. I do remember mentioning my online space to my very close friends, but I just assumed they wouldn’t “get” it, so I avoided the topic quite a lot. The first person in my life I spoke to about my blog and web development interest was Tyrone. And I’m 99% sure it was before we started dating. Tyrone and I had been talking on MSN for many many months before we became a couple, and during this time we got to know each other a lot better. He asked me “wwup2?” and I replied “Working on my website.”. And just like that I had broken the silence on my blog. It was one thing admitting I had a website, but a whole other thing sharing the link to said website. Luckily Tyrone thought it was pretty cool, and has been supportive from day one. Little did he know at the time but 7 years on I would be pestering him to take photos of me all in the name of blogging! I think my family and friends started to find out about my blog when I began sharing links to my blog on Twitter, which was probably when I was in college, or maybe even as late as when I started university. I would go into a completely meltdown when people said they had read my blog and panic about what I had published, but honestly, I don’t think I’ve ever experienced any negativity or backlash from telling people about my blog. As blogging became more popular, more people started to understand what it was all about. If I’d said to someone at a job interview 10 years ago (hypothetically, because I would have been 12!) that I wrote a blog, I doubt an employer would have cared. Nowadays though, if you say you write a blog then most employers will know what you do and the skills you have. I first put my blog down on my CV when I applied for a job as an Insight Leader; a job which partly involved writing a blog about student life. Of course, I got those horrible feelings of embarrassment and shame, but in the end it helped me to get the job. Ever since then I have kept it on my CV and will happily talk about it at interviews because I know it’s something to be proud of, not to be ashamed of. I’m still not totally confident in admitting to people I have a blog. I’ve never shared a link to my blog on Facebook that my “friends” could see in fear that someone would take the piss, but really, should I care about those people who don’t support me? However, nothing means more to me than when someone I know, whether that be a friend, a family member or a colleague, says to me “I read your blog and I liked it.”. And as someone who has benefited in life from telling people about my blog, I know that being a non-secret blogger can be amazing too. Are you a secret blogger? Or are you “out and proud”?! Liked this post? 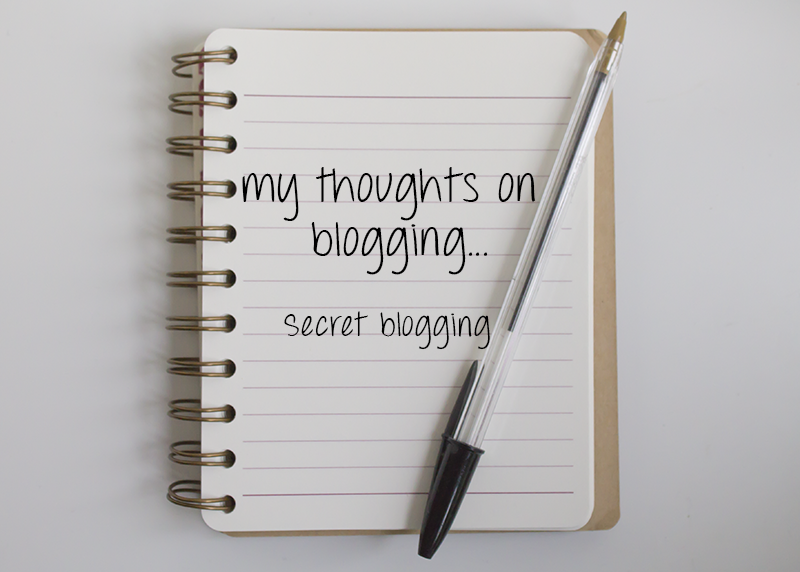 There’s more in the “My thoughts on blogging…” series right here! Just like you, I’m not a really a ‘secret’ blogger, but I don’t really bring up my blog in real life either. I share it on my public twitter, but I don’t think many of my friends/family are very active on twitter so they don’t see it as far as I know. A few friends know about it and have said that they think it’s great, but I don’t think they’re regular readers either! I’d love to have the confidence to share it on my personal facebook, but that feels a step too far right now. I think we all have our pace when it comes to this sort of thing. Some will put it out there straight away and others will be slower. I’m proud of what my blog has become as my style of writing has developed. I’m not sure if I could have dealt with the criticism when I was younger and less experienced in the world of blogging. When I first had a website, I told everyone. I thought it was really cool and I wanted people to use the ‘blinkies’ and stuff that I made onto their Myspaces. As I got older and stopped making Myspace things, I kept my blog a half secret. My direct family know I have a website, but they don’t look at it. I have a link for it on my Facebook About Me. but I never advertise that it’s there. I put it in places where people can find it if they look – but I wouldn’t make them look if that makes sense? Matt knows I have a website but he takes the mick out of me a lot for it! That sounds like a good approach. It’s less in your face and probably attracts the right audience. I’ve had the mick taking out of me before when I mention I write a blog because some people think that blogging as all about getting as many freebies as possible, so when I explain to them why I blog and what I blog about I think it surprises them, and hopefully changes their opinions. Perhaps it is that blogging is so much more revealing and requires so much more effort than just posting a pic on Instagram, so when someone we know sees it the stakes are that much higher? That’s so true! I don’t know why I see blogging so differently to social media outlets. It is probably because blogging is more revealing. I rarely ever post on Facebook, yet on my blog I talk about deep topics that I wouldn’t ever talk about with old school friends. I used to keep my blog a complete secret from people IRL because I’ve gotten comments from classmates in high school, “laaaame”. This didn’t stop me from blogging all these years :). You learn lots of skills from blogging, whether it’s improved writing/reading skills or social skills. It’s beneficial and a great thing to be part of! I’m glad to hear that blogging helped you with impressing the interviewers and the likes. Some bitchy people at my old high school found out about my blog and I almost stopped blogging because of it, not that I ever heard them say anything about my blog. I definitely think that my colleagues have been the most understanding people when it comes to my blog, and I think they get it because they work in technology. Oh I remember being very afraid of telling my family about my blog too. I remember i was actually not shy about telling that I have a blog quite recently when I went for my post-graduation degree. I am also a little embarrassed of putting my blog on my resume now when I am going to apply for jobs this semester. Hopefully it will help me! I hope it helps you too! It might help you stand out from the crowd. I suppose I’m more of an out and proud blogger. I don’t really shove it in peoples faces but I don’t hide it. I started to make websites when I was around 14 as well. I was sickly as a kid so it isn’t really surprising that I took to making websites and blogs. My family was very supportive and it actually brought me to my current job. I’m not nearly as active as I use to be but I do try still. It’s interesting to hear someone else experience with it though. I was quite ill as a child too (hip dysplasia) and I think it made me quite introverted. Perhaps that’s why I took to making websites too. Everyone who is a secret blogger has their reasons and I respect that, even though I was never one myself. I didn’t try to hide the fact that I liked to blog, but I did write some shameful things in the past. I had a semi-private blog at some point, which I later made public, but didn’t publicise or share with anyone. People would just happen upon it, and that was that. I laughed at your comment about Tyrone helping you take pictures. It is amazing how blogging is a huge part of our daily lives now. Our whole trip, Nick keeps checking if I ‘need to write a post tonight’. Hahahaha. I had a private Blogger blog (*shudders*) years ago where I wrote things anonymously that I was afraid of other people discovering. Haha, it’s so funny how blogging can impact on a relationship, and it’s great when your other half gets it. In my second year of university we had to write a reflective log as part of the group coursework we were doing, and because of my reflective writing skills I’ve gained through blogging I nailed that work! Everyone else struggled! It’s kind of hard to share everything online after taking internet security courses in college. I learned a lot to the point that it made me feel paranoid and I stopped taking those classes because it was too much information. As to your post, I do feel unsure about sharing my blog to the people I know as well, but I’m slowly easing my way out of this uncertainty. Why is it so easy to share personal thoughts to strangers compared to the ones you know in real life? I think if I took an internet security course it would terrify me! I’ve told things to people I’ve never met online that I would never dream of telling to my close friends. It’s madness, isn’t it?! I was in the same boat, at first! The only person who knew about my blog was my best friend and literally that was it. I do remember the majority of my friends have Piczo websites, and also Matmice pages – it was mostly just to show who their best friends were and what school they went to and silly things like that. I think I was the only one out of friends who actually went a step further and actually started adding pages and researching what I could do to make my site stand out. My mother knows I blog now, but I swear if I had told her when I started she would have banned me because talking to “strangers” online, like you mention. It wasn’t until I started getting invited to events, that I told my mum that it’s “for my blog”. To this day, I still don’t know if she has actually read my blog. Ha. I remember I changed domains in my second year of uni because it was discovered whilst I was studying in China and I was made fun of for it. That was pretty traumatising. The reasoning that it should be read out loud in class because “I had put it all online, anyway” made me so angry, because so what? It can still be private, which is something I don’t think people who don’t blog understand. A lot of my friends had Piczo sites too, but they never updated them for any longer than like a week. Haha, I remember when I told my mum I was going to my first blogging event and she was so worried that I was going to get kidnapped! I never was real secretive about my blog. I usually shared it around and stuff. But I can see why you wouldn’t want to. It can be scary when people you know read it and stuff. I think it’s scary because I instantly assume people will hate it! I am partly a ‘secret blogger’. But I am not too worried if people do find my blog. Many years ago it was different, because having a blog and website was a bit weird (before the rise of social media) and a lot of people didn’t understand what ‘being online’ was all about. I think it’s also a bit difficult when you created an alias and it has been a part of you for so long, that it is forms some of your identity. When I told people years ago that I wrote a blog and I could code they assumed I was a hacker or doing dodgy stuff online. Couldn’t have been further from the truth, haha! The idea of family and other people I know offline reading my blog makes me feel weirder than lots of random people reading it, be they bloggers I’ve not come in contact with or people who don’t blog but somehow found my blog. I am weirded out, though, when I notice my page views rise, because I have huge stage fright, which I have found seeps through to the Internet. Now, though, I’m trying to carry myself a little more professionally/maturely, because of reasons I’m not yet prepared to reveal yet. I always panic when my stats say I have referrals from Facebook. I can’t even find out where they’re coming from on Facebook so it scared the hell out of me! When I was in high school I kept blogging a secret as it felt “geeky” and “nerdy”. To be honest, I didn’t want the other girls in the school to find my blog and laugh at it. During that time, I only blogged about my school life so I didn’t want people to think anything bad of it. Since then I’ve move between domains and changed style and focus. Nowaday, blogging is totally “in”, all my friends and families know about it, and they are very supportive. They read blogs too, they follow food, fashion, travel etc blogs but none of them really get involved in writing any. Some of them have started but gave up after a while. I have a few ex-colleague that follow my blog regularly as they love reading about my travels and seeing my photos. I really love that I can be open and proud about my blog now. I am currently a “secret blogger”, mainly because some of my views and opinions are untraditional and taboo where I come from. I just want to write what I want to write about without persecution or my family telling me to “take it down” simply because it’s controversial for my family to see. I am by no means writing about anything inappropriate, just things they don’t want to talk about because, again, it’s taboo. Before this I used to post my blog entries and link my website on Facebook and all other social media websites. My parents always knew about and supported what I did online from an early age simply because it kept me out of trouble and it was something I was passionate about. I used to show them all of my latest graphics and website layouts that I coded by hand. Now, no one knows unless they are on Twitter. That said there is a sense of freedom when you don’t have to worry about who sees your website. Knowing that I can post whatever is relevant without hearing from my family about it is freeing. I often find that there are subjects I want to write about but can’t because I’m aware of who reads this blog and I’m worried about backlash from what I’ve said. My mum tries to tells me to remove Tweets where I’m slagging off a company, but that’s how we get things done in the 21st century! When I was younger, I was a “secret” blogger. Just because I was scared of getting judged by my peers who at that age didn’t care much of online-stuff. I had a friend or two who I told my blogging habits and website about, and actually encouraged them to create their own too! All on Piczo/Freewebs at the time. I remember telling my ex about my site a few years ago and he would make fun of it and call it “dumb”. You’d be pleased to know, I’m with my current boyfriend who encourages me, reads my posts (signs up to email notifications lol) and takes photos for my blog even when I don’t plan them, he’s like, “OMG THIS WOULD BE AWESOME FOR A BLOG” Haha! I’m glad he’s your ex! You don’t need men in your life like that! I love how partners can get so involved with blogging. I always cringe when someone says “I read your post” but then when they say they liked it I feel so much better. Well, I’ve never had someone say they hate what I do! I honestly don’t believe I was ever a ‘secret blogger.’ I think a few of my friends both online and offline knew about my blog, but didn’t really phase them that much. I also know for a fact that my father knew about me blogging and was okay with it as it gave me something to do (he’s all for me having something to do). Not only did my father knew about me blogging, he also purchased the domain and hosting for me. I was just a Sophomore in high school when I began blogging. I honestly believe my friend at the time got me hooked on web development as well as blogging. Very interesting how each of us have a back-story as to how we got introduced into web development. Isn’t it? I really wanted a domain when I was younger but I was terrified of asking my parents if they would buy me on (because I didn’t have a bank card at the time) because then they’d know about my blog.